The cerebellum, which looks like a separate structure attached to the bottom of the brain, plays an important role in motor control. The cerebellum can be separated into three lobes: the flocculonodular lobe, anterior lobe, and posterior lobe. The medial zone of the anterior and posterior lobes constitutes the spinocerebellum, or paleocerebellum. the cerebellum as in the neocortex. fissure), and the posterior lobe (below the primary fissure). granule cells: An extremely small type of neuron that is the the smallest cell found in the brain. neocortex: The largest part of the cerebral cortex of the human brain, covering the two cerebral hemispheres. 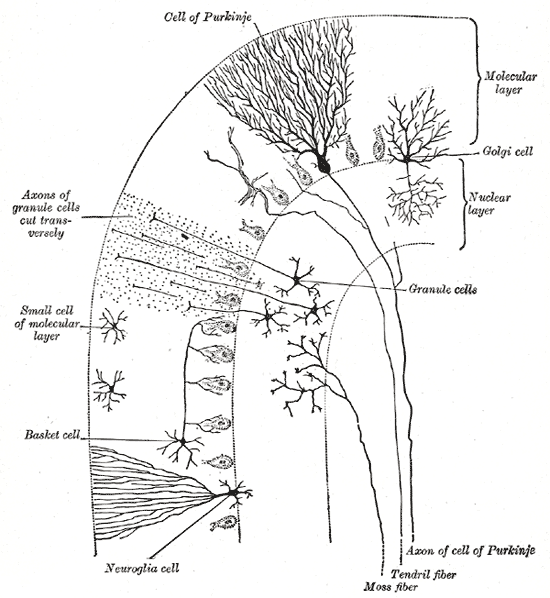 Purkinje cells: A class of GABAergic neurons located in the cerebellar cortex that are some of the largest neurons in the human brain. cerebellum: Part of the hindbrain. In humans, it lies between the brainstem and the cerebrum. It plays an important role in sensory perception, motor output, balance, and posture. The cerebellum has the appearance of a separate structure attached to the bottom of the brain, tucked underneath the cerebral hemispheres. The surface of the cerebellum is covered with finely spaced parallel grooves, in striking contrast to the broad irregular convolutions of the cerebral cortex. These parallel grooves conceal the fact that the cerebellum is actually a continuous thin layer of tissue (the cerebellar cortex), tightly folded in the style of an accordion. This thin layer contains several types of neurons with a highly regular arrangement, most importantly Purkinje cells and granule cells. This complex neural network gives rise to a massive signal-processing capability, but almost all of its output is directed to a set of small deep cerebellar nuclei lying in the interior of the cerebellum. Cells of the Cerebellum: Transverse section of a cerebellar folium, showing principal cell types and connections. The cerebellum is separated from the overlying cerebrum by a layer of leathery dura mater. Anatomists classify the cerebellum as part of the metencephalon, which also includes the pons, and all its connections with other parts of the brain travel through the pons. 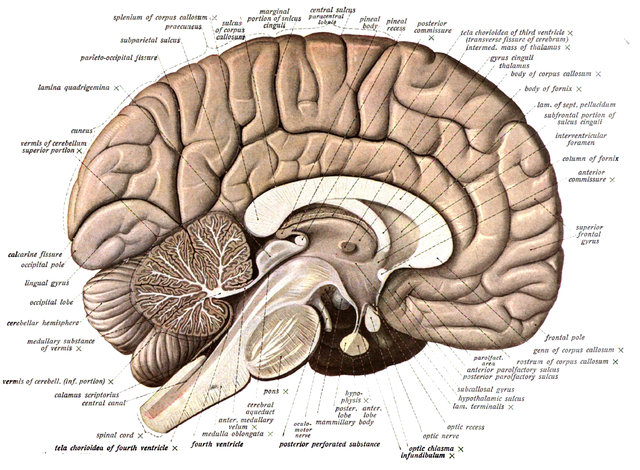 The metencephalon is the upper part of the rhombencephalon, or hindbrain. Like the cerebral cortex, the cerebellum is divided into two hemispheres. It also contains a narrow midline zone called the vermis. A set of large folds is, by convention, used to divide the overall structure into 10 smaller lobules. Due to its large number of tiny granule cells, the cerebellum contains more neurons than the rest of the brain put together, but comprises only 10% of total brain volume. 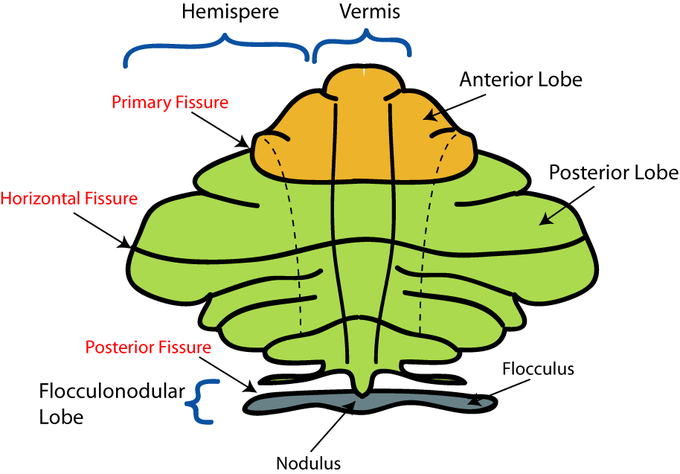 Based on surface appearance, three lobes can be distinguished in the cerebellum: the flocculonodular lobe, anterior lobe (above the primary fissure), and the posterior lobe (below the primary fissure). Excluding the flocculonodular lobe, which has distinct connections and functions, the cerebellum can be parsed functionally into a medial sector called the spinocerebellum and a larger lateral sector called the cerebrocerebellum. A narrow strip of protruding tissue along the midline is called the vermis (Latin for “worm”). Divisions of the cerebellum: Schematic representation of the major anatomical subdivisions of the cerebellum. Superior view of an “unrolled” cerebellum, placing the vermis in one plane. The smallest region, the flocculonodular lobe, is often called the vestibulocerebellum. It is the oldest part of the brain in evolutionary terms (archicerebellum) and participates mainly in balance and spatial orientation. Its primary connections are with the vestibular nuclei, although it also receives visual and other sensory input. The medial zone of the anterior and posterior lobes constitutes the spinocerebellum, also known as the paleocerebellum. It receives proprioception input from the dorsal columns of the spinal cord (including the spinocerebellar tract) and from the trigeminal nerve, as well as from visual and auditory systems. It sends fibers to deep cerebellar nuclei that in turn project to both the cerebral cortex and the brain stem, thus providing modulation of descending motor systems. The lateral zone, which in humans is by far the largest part, constitutes the cerebrocerebellum, also known as the neocerebellum. It receives input exclusively from the cerebral cortex (especially the parietal lobe) via the pontine nuclei (forming corticopontocerebellar pathways), and sends output mainly to the ventrolateral thalamus (in turn connected to motor areas of the premotor cortex and primary motor area of the cerebral cortex) and to the red nucleus.